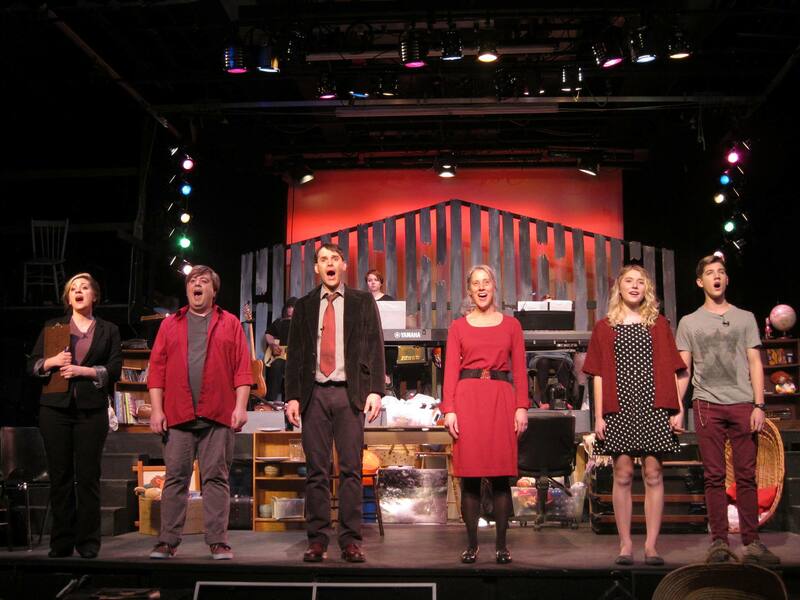 Next to Normal isn’t your normal community theatre production by a long shot. You’d be hard-pressed to have a few laughs or find familiar lyrics in this production by Goderich Little Theatre, running until April 16. Rather, the rock musical that first hit Off-Broadway in 2008, is a relevant, weighty commentary on the effects of mental illness on a family, also touching on dysfunctional relationships and drug addiction – with no real upside. It’s the story of a mother (played by Susan Carradine-Armstrong) who struggles with bipolar disorder while trying to hold together her small family, a father (played by Matthew Hussey) who is bound by a sense of duty and forever hopeful that the next treatment will bring a cure, a subtly manipulative son (played by Jordan Henry), and an angry, forgotten daughter (Liv Hussey) who turns to pharmaceuticals for solace. It is a wonderfully sad, raw story in which possibly any of us can find a little bit of ourselves. In Saturday night’s performance, the cast of six embraces this big script, heavy in lines and music, with an energy and believability that could rival any number of professional theatre performances. Director Jordan Henry, who also plays the son, delivers an inspiring interpretation of the play, with music by Tom Kitt and book and lyrics by Brian Yorkey. His vision is clear and crisp, with well-defined characters that make the story easy for the audience to follow, even with a few surprises thrown in. In particular, Carradine-Armstrong is spellbinding as the mother, equally believable manically making sandwiches on the kitchen floor as she is eloquently expressing love for her teenaged daughter. At times she is coy and playful, at other times regretful and lost. Always, she makes her character shine. Two youths (Liv Hussey and Ben Hearn, as the daughter’s boyfriend) who hold their own on stage with veteran actors may be a testament to the strong drama classes in our local high schools. Cara Stephenson has the challenge of playing various doctor characters that I didn’t find particularly well-written – an issue for the playwright rather than the local performers – but she has a bit of fun in her roles and has a bold singing voice that fits nicely with the rest of the cast. The set design is intriguing, with broken, wide-set boards in the shape of a house at the back of the stage, a backdrop to the band on risers in full view of the audience. The remainder of the economy-sized stage is cluttered with furniture and props that are simply rearranged as required. When: April 14-16 at 8 p.m.
How: Box Office open Tuesday from 10 a.m. to 1 p.m. and Wednesday to Friday from 3 p.m. to 5:30 p.m. Rush seats, if available, on sale 30 minutes before performance. Tickets online at www.livery.ca (may take up to three days to process). Members: $20 adults, $18 seniors, $15 youth under 18, $10 children under 12. Non-members: $25 adults, $22.50 seniors, $15 youth under 18, $10 children under 12.